Put the flour, salt and butter in a food processor and whiz until the mixture resembles fine crumbs. Tip into a bowl and add the egg yolk along with enough cold water to roughly bind into a dough. Lightly knead on a floured surface then wrap and chill for 30 minutes. Remove the stalks from the cherries. Halve the cherries and remove their stones. Melt the butter in a non-stick frying pan over a low heat. Add the lemon juice and sugar and stir until the sugar has dissolved. Mix in the cherries and increase the heat slightly. Cook, stirring, for 3 minutes, add the Kirsch, then set it alight to burn off the alcohol. When the flames go out, tip the cherry mixture into a bowl and leave until cold. Meanwhile, preheat the oven to 180°C, gas mark 4. Lightly butter a 12-hole bun tin (the holes should be about 6cm across). Roll out two-thirds of the pastry thinly and stamp out 12 circles with a 7cm pastry cutter. Roll out the remaining pastry and trimmings and stamp out 12 circles with a 6cm pastry cutter. Line the bun tin with the larger circles. Fill with the cherry mixture. Brush the edges of the smaller circles with milk and lay on top of the filling (milk side down) to form lids. Press lightly around the edges with the back of a teaspoon to seal, then prick a hole in the top of each pie with the tip of a knife. 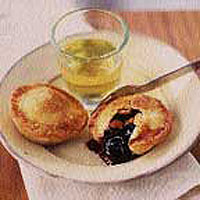 Glaze the pies by brushing each with milk and sprinkling with granulated sugar. Bake for 20 minutes until pale gold. Turn out on to a wire rack. Serve hot, warm or cold with clotted cream.